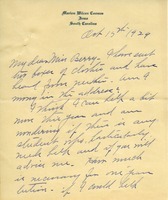 Martha Berry thanks Mrs. Heath for the package of warm clothes that she donated to the Berry Schools. 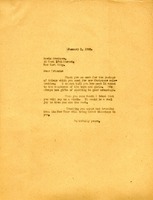 She explains that the need is great and that she will give everything in the package to needy children. 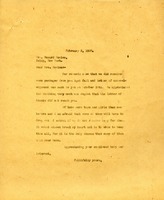 Miss Chace requests that Martha Berry inform Miss M.C. 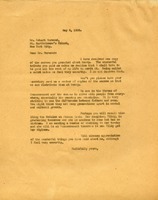 McLean as to whether or not she received a box of clothing that was sent to the Berry Schools. 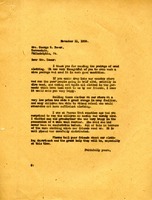 In this letter Martha Berry is thanking Mrs. Bower for sending a package of used clothing to the school. Miss Berry goes on to explain how helpful it is in clothing some of the poor people of the area, even helping some of them go to school. 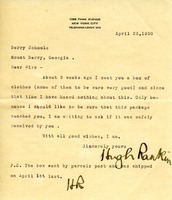 She even gives the personal story of an elderly lady who was thrilled by a wool sweater she got. 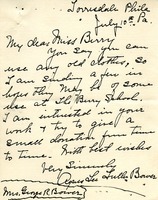 Mrs. Bower writes to donate some old clothing and hopes they can be of use. 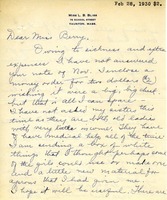 In this letter to Martha Berry, Lucy Bliss writes of a money order she has sent, along with some clothes and material for the girls to use. 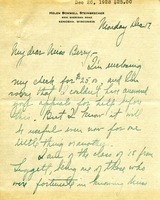 She also inquires after Martha Berry's health and observes that Mr. Ford is working on a few new schools. 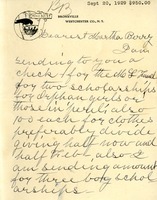 Mrs. Steinbrecher sends a check for $25 and asks if Miss Berry is still accepting offers to send clothes. 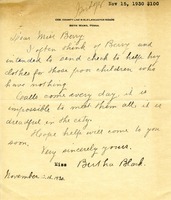 Martha Berry thanks Mrs. Nevins for the clothes she sent and tells her that several students may have to drop out without some help.